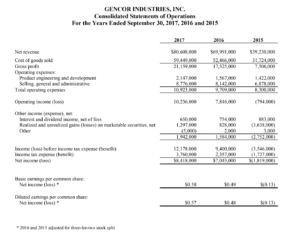 December 6, 2017 (PRIME NEWSWIRE) – Gencor Industries, Inc., (NASDAQ: GENC) announced today net revenue for the quarter ended September 30, 2017 increased 25.4% to $18.6 million compared to $14.8 million for the quarter ended September 30, 2016. Gross profit as a percentage of net revenue decreased to 19.7% for the quarter ended September 30, 2017 from 24.7% for the quarter ended September 30, 2016 due to competitive pricing on two plants. Income from operations for the quarter ended September 30, 2017 was $0.8 million compared to $1.0 million for the quarter ended September 30, 2016. The Company had non-operating income of $0.7 million for the quarter ended September 30, 2017 compared to $0.3 million for the quarter ended September 30, 2016. The Company had tax expense of $0.6 million for the quarter ended September 30, 2017 compared to a tax benefit of $(0.4) million for the quarter ended September 30, 2016. Net income for the quarter ended September 30, 2017 was $1.0 million ($0.07 per basic and diluted share) compared to $1.7 million ($0.12 per basic and diluted share) for the quarter ended September 30, 2016. Net revenue for the year ended September 30, 2017 increased 15.2% to $80.6 million compared to $70.0 million for the year ended September 30, 2016. Gross profit as a percentage of net revenue increased to 26.2% for the year ended September 30, 2017 from 25.0% for the year ended September 30, 2016. The Company had operating income for the year ended September 30, 2017 of $10.2 million compared to $7.8 million for the year ended September 30, 2016. The Company had non-operating income of $1.9 million for the year ended September 30, 2017 compared to $1.6 million for the year ended September 30, 2016. The effective income tax rate for fiscal 2017 was 30.9% versus 25.1% in fiscal 2016. The Company’s net income was $8.4 million ($0.58 per basic share and $0.57 per diluted share) for the year ended September 30, 2017, compared to $7.0 million ($0.49 per basic share and $0.48 per diluted share) for the year ended September 30, 2016. At September 30, 2017, the Company had $110.8 million in cash and marketable securities, an increase of $6.7 million over the September 30, 2016 balance of $104.2 million. Net working capital was $124.7 million at September 30, 2017. The Company has no short- or long-term debt. 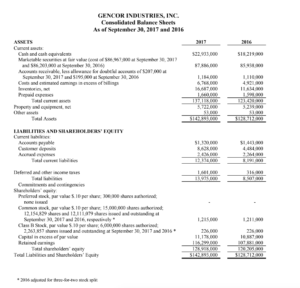 John E. Elliott, Gencor’s CEO, stated, “I am pleased with our fiscal 2017 performance. Our solid financial results continued throughout 2017 with year-over-year revenue growth, gross margin improvement, increased profitability and strong cash generation. Our fourth quarter 2017 revenues exceeded $18 million, up significantly from prior years’ fourth quarters. Revenue growth was attributable to greater demand for our asphalt plants. Gross margins were lower in the fourth quarter due to pricing on a few strategic projects. For the year, gross margins increased to 26.2%. Gencor managed 15% growth in fiscal 2017 revenues with solid execution, resulting in an increase in both gross margins and operating margins for the fiscal year. Underlying demand for our products continues to be strong, positioning us for continued profitable growth as we begin fiscal 2018. Orders for new asphalt plants were placed throughout the summer and early fall months. Current backlog of $46 million represents a 44% increase from a year ago and a 127% increase from two years ago. Order inquiry for our equipment continues to be strong. Gencor Industries is a diversified heavy machinery manufacturer for the production of highway construction materials, synthetic fuels and environmental control machinery and equipment used in a variety of applications. Caution Concerning Forward Looking Statements – This press release and our other communications and statements may contain “forward-looking statement,” including statement about our beliefs, plans, objectives, goals, expectations, estimates, projections and intentions. These statements are subject to significant risks and uncertainties and are subject to change based on various factors, many of which are beyond our control. The words “may,” “could,” “should,” “would,” “believe,” “anticipate,” “estimate,” “expect,” “intend,” “plan,” “target,” “goal,” and similar expressions are intended to identify forward-looking statements. All forward-looking statements, by their nature, are subject to risks and uncertainties. Our actual future results may differ materially from those set forth in our forward looking statements. For information concerning these factors and related matters, see our Annual Report on Form 10-K for the year ended September 30, 2017: (a) “Risk Factors” in Part I, Item 1A and (b) “Management’s Discussion and Analysis of Financial Position and Results of Operations” in Part II, Item 7. However, other factors besides those referenced could adversely affect our results, and you should not consider any such list of factors to be a complete set of all potential risks or uncertainties. Any forward-looking statements made by us herein speak as of the date of the press release. We do not undertake to update any forward-looking statement, except as required by law.